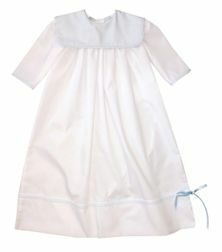 This is our darling Heirloom Baby Infant Boy Day Gown-Dressing Gown-Coming Home Gown-Shower Gift in Batiste. 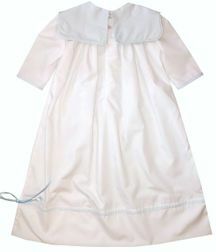 The gown is made in white with your choice of color collar and skirt ribbon. The gown buttons in the back with the collar circling to the back. The skirt has satin ribbon matching the collar color. The sleeves are also piped in the collar fabric.